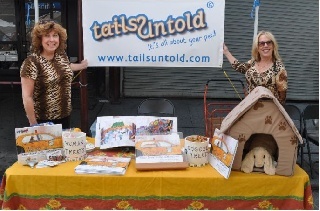 Susan Lyman, President and Founder, with the assistance of her sister, Janet Lyman, started a very unique and fun business called Tails Untold Personalized Pet Books. Pet lovers personalize their TAILS UNTOLD ADVENTURE BOOK by going online, uploading photos, and filling in information about their pet including a special memory. Their own pet’s photos are artistically placed in the stunning illustrations and the story is then personalized to their pet. The final result is a coffee-table style, hard cover book with a whimsical story about your pet’s adventures in the Big Apple. They both feel every pet deserves a loving home and they donate a percentage of the sale of each Tails Untold® book to an animal shelter or rescue. With a love for animals, a talent for creating and writing, Janet and Susan Lyman joined forces to create the blog Tails Untold. “We wanted to create a blog that was fun and whimsical, like their Tails Untold Personalized Pet Book Business, and one that would also provide helpful and important information to inform and assist in making every home a happy and loving home for both pet families and their pets,” Susan says. While Susan is busy running the daily operations for Tails Untold, Janet writes most of the blogs. Susan reports, “With her 30 year career as a Speech Pathologist Teacher, Janet, has a knack for finding very unique, current, and interesting topics to research for the blog and she has a special talent for creative writing.” The topics are varied and cover everything from how to care for a new pet or senior pet to pet funnies. For more information, visit the Tails Untold blog at www.tailsuntold.com.